Istvan Bakx played from 2007-2009 at KV Kortrijk. He came from the amateurs of Hoek and was an Holland amateur international. Manager Hein Vanhaezebrouck found the striker on Google where he read successful matchreports of the player. He followed his manager to their new club Racing Genk when the contract of the "Google-striker" expired in 2009. He signed a 3-year contract until 2012. In summer 2010 he was loaned out for a season to FC Den Bosch from the Dutch second division. His former manager Vanhaezebrouck was sacked in January 2010 and his play chances after that were minimal. Bakx returned to Belgium at the end of his loan period. His future was unsure at the club in his final contract season. In mid-season 2011-12 he returned to The Netherlands. Bakx went on a free transfer for the rest of the season to Willem II. In May 2012, the club did not offer him a new contract and Istvan Bakx has left the club. At the end of July 2012, Bakx signed a one year contract at AGOVV Apeldoorn. On 11 January 2013, AGOVV was declared bankrupt and Bakx became a free agent. 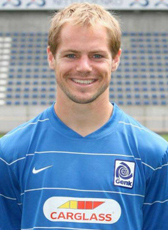 He returned to his former club FC Den Bosch and extended his stay until 2014 in April 2013. In summer 2014 he moved to neighbours FC Oss for the 2014-15 season. During the 2014-15 season his contract was renewed with one season. One year later the contract of Bakx was again renewed until 2018. After expiration of his contract at Oss, he signed a contract at Go Ahead Eagle for the 2018-19 season.